Can you help raise money for AECC (Cancer research in Spain) and the Samaritans in Spain? Can you help us support our friends who are riding for a great cause? The Bull boys are off on another adventure to raise money! 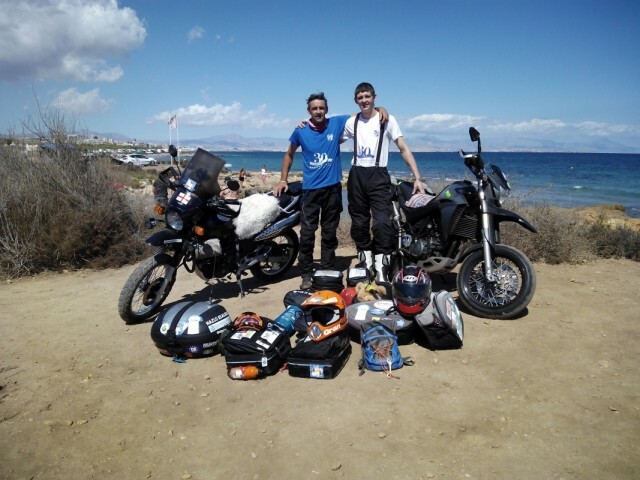 Not long to go until father and son team, Dave and Mitch Bull, are off on their epic journey around the coast and borders of Spain on motorbikes. They are raising money and awareness for the AECC (Cancer research in Spain) and the Samaritans in Spain, of which Dave is the patron. Twenty-three days travelling will see them visit most of Spain´s biggest cities and along the way they´ll be meeting up with groups and local contacts who are supporting them. to cover almost 400 kilometres each day without using motorways and sticking as close as possible to the coast and the borders with France and Portugal. they´ll have just five euros each per day for food and drink because they both want to keep costs to a minimum. Each night they´ll be looking for a friendly campsite where they can pitch their tent for free and, fortunately, with both of them having a passion for cooking, the evening meal should at least be tasty, although a Camping Gaz stove restricts the variety on the plate somewhat! Following on from last year´s successful challenge to row two kayaks down the River Segura, from Murcia to the coast at Guardamar (52km), which raised over €3,000 for the charities, Dave and Mitch have raised the bar this year to try and cover the 7,500 kilometres in the time allocated and visit some of Spain´s best known places. Their progress will be updated every day on social media with videos and images of the day´s ride. And along the way, they will meet up with biker groups who will join them on parts of the trip and with local businesses who will show them around the locality. CAN YOU HELP? Both riders are highly experienced on motorbikes having raced on the circuits here in Spain up until a few years ago and with Mitch having sat, and ridden, his first motorcycle at the tender age of five years old the pair are well equipped for what will surely be a test of endurance and conditions as the weather in the north of Spain and in the mountains of the Pyrenees and Granada will be completely different to what they will find in the Southern part of the country. With both bikes loaded with around 50kg of equipment, and as Dave says, “a few boxers and t-shirts”, the going certainly won´t be swift, especially in the seaside towns and cities that they´ll be passing through every day. MOST IMPORTANTLY: the donation page https://www.gofundme.com/2ggh7wqc where all donations will go straight to the two charities. Personal and Business Donations Welcome! 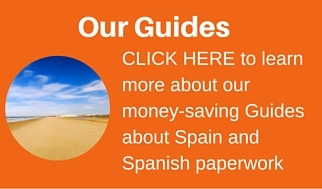 Are you a local Business in Spain? Contact us for Sponsorship opportunities! 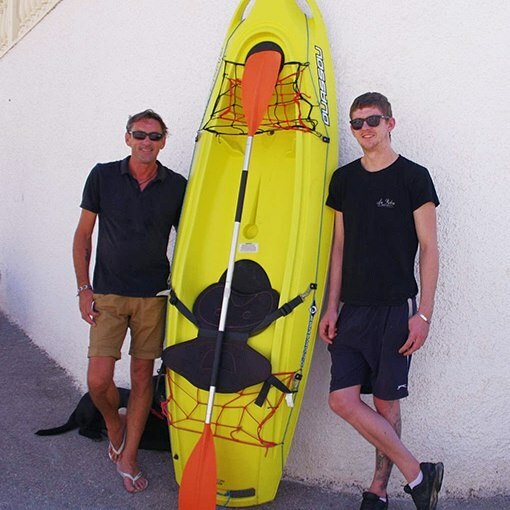 Dave and Mitch will be leaving Gran Alacant (town hall car park) on the 27th of September at 12pm and heading up to Alicante Castle before continuing the journey to Valencia where they will camp out for the first night. Barcelona follows on the 28th with an appearance on Simon Harris´s radio show on Barcelona FM. Then they´ll be off to Gerona before heading across the Pyrenees for two days. It´s a long time on the road but the boys are sure to have some amazing experiences along the way which you´ll be able to see for yourself via the various medias available. We´ll keep you updated here too so keep an eye out for the ‘Challenge’, and the two of them coming through your town in October.